Rosary is a string of beads used in counting prayers. The word Rosary comes from Latin "rosarium", meaning "Crown of roses". Rosary is used for combining prayer and meditation. 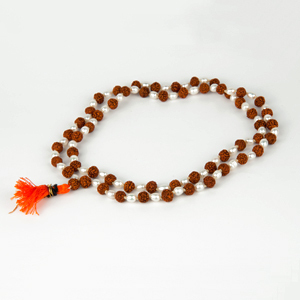 Rosary is used to do meditation with Mantra. Rosary can have different number of beads but generally that of 108 beads is considered most auspicious and mystical because it is believed that this number has spiritual significance and therefore this number is generally encouraged. 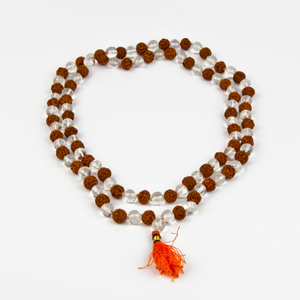 Seers also say that a rosary of 108 beads gives accomplishment of all Siddhis. Rosary is generally used to count the number of a Mantra that one is reciting. This form of prayer which if done daily shall lead you to discover a profound relationship with God or Goddess. Different types of rosaries cause different types of impacts and are used to recite the mantras of different gods or goddesses to fulifill your wishes. It has been mentioned in different classics that Rudraksha rosary is useful and benefits would go on increasing with the number of Rudrakshas one is wearing. 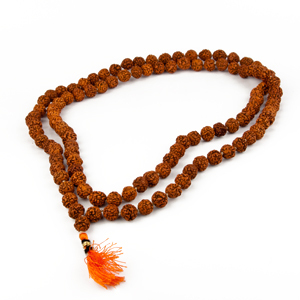 A rosary of pure beads of Rudraksha is very useful and keeps the blood pressure of the person normal and makes him/her virile. It is useful in the development of ones intellectual faculties. It renders mental peace to the person and brings benefits in business and trade. 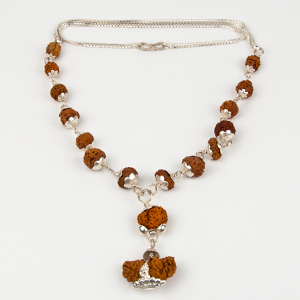 Rudraksha are known for their healing powers. The most effective reason is one comprised of 1 to 14 faced rudraksha which proves highly beneficial not only for eradication of miseries and diseases but also brings good luck.